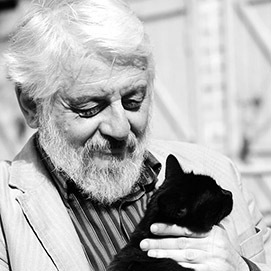 Boris Khersonsky (1950), poet, translator, professor of clinical psychology, lives in Odessa where he graduated from the Institute of Medicine in 1974. In youth, he participated in dissident literary culture and appeared in the émigré press such as “Novoe russkoe slovo” and Radio Svoboda. His published poems abroad in the mid 1980s. Since the 1990s, his poems have appeared in Russia and Ukraine in numerous literary journals and various anthologies. In 2006 he published the first poetry book in Russia, Family Archive, followed in 2008 by Under Construction and Out of Fence. In 2009 he collected his poems about Italy in Marble Sheet (Italian edition edited by C. Scandura in 2010) and in 2010 published The Spiritual Collection. He is the winner of numerous literary awards, since 1998 he has been the editor of the magazine “Kreščatik.” He won the Foundation's Josif Brodsky Prize in 2008. For the publication of the German edition of "Familien-archiv" (Wiesel Verlag) in 2010, he was awarded the special prize "Literaris" (Austria).